French firm Vitus made a name for itself creating innovative aluminium road bikes in the 1980s. Now, via Northern Ireland’s Chain Reaction Cycles, Vitus has a full range of road and mountain bikes available to UK customers. The Nucleus 0.1 is the company’s entry-level off-roader. The frame in particular is a work of mtb art. There’s no getting away from the fact the tubes are humungous, but they’re not simply scaffolding poles welded together. Each has been shaped purposely, and the intricate, morphing forms of the hourglass seat and chainstays are particularly impressive. The spec’s impressive too: SRAM X4 kit gets you moving, a set of Avid Juicy 3 hydraulic disc brakes bring you to a halt, and a Suntour 100mm suspension fork with lockout is fitted up front. Vitus-branded parts from ProLite, including the seriously solid set of wheels, round the bike out. It’s a strange mix of utilitarian and flash — a tractor painted Ferrari red. After stepping off the graceful Specialized, hopping on the Vitus also feels like mounting a piece of agricultural machinery. Putting the two bikes together reveals that the actual riding positions are very similar, but such is the power of suggestion — with those thick ol’ tyres and heavy-duty tubes underneath you — you’d be forgiven for thinking you were another inch or so higher. So from the saddle you get a good view of the road, which is great for realising that you are moving very… very… slowly. 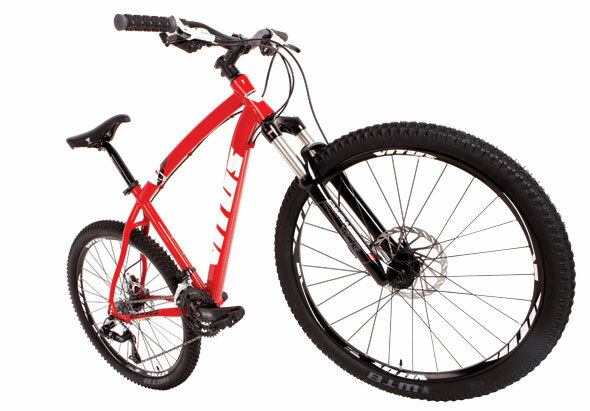 The Vitus is half a stone heavier than the Specialized, and it feels it. Shifting the bike up to speed and maintaining that velocity takes a concerted effort. Climbs appear where previously you never noticed them, and even quick road stretches become interminable efforts. On tarmac, even with the fork locked out, the grippy rubber boots make handling rather laboured. And just to add insult to injury, those ballooning WTB tyres produce a fair old hum — and that noise is being powered by your energy, damn it. No surprise, then, that the Vitus and I headed off-road at the earliest opportunity. And then what a transformation. The lazy control turns into a strangely relaxed assuredness as you slip and slide through mushy stuff. Meanwhile the back end dances around entertainingly without ever breaking away. Those chunky tyres finally come into their own, offering grip where by rights there should be none. And while the Specialized froze at the merest sight of ice, the Vitus happily crunches onwards. The fork’s not quite right though, with too little rebound damping meaning the fork springs back to its original length too quickly after compressing, something that can unbalance a rider. That excellent spec — which is really quite incredible for a £560 bike — proved its worth. The SRAM gearing offers enough speeds to keep you spinning through the gloop, although I found the thumb shifters slightly less convenient than the Shimano options on the Sirrus: you have to move your thumbs under and around the nearest shift paddle to access the other, which takes a little while to get used to. But connected to the brake levers the Avid discs do a fine job of bringing this heavy machine to a stop, squeal-free, and with a notably more progressive feel than the Sirrus’s all or nothing V-brakes. Simply put, this is a good mountain bike, but the slog home highlighted its shortcomings as a road machine. Ironically, pedalling the Vitus on tarmac is like cycling through mud, but when you actually reach the squelchy stuff it comes alive. So if you’re tempted off-road the Nucleus 0.1 could be the perfect introduction. Specialized is a company with a solid grounding in mountain bike history. 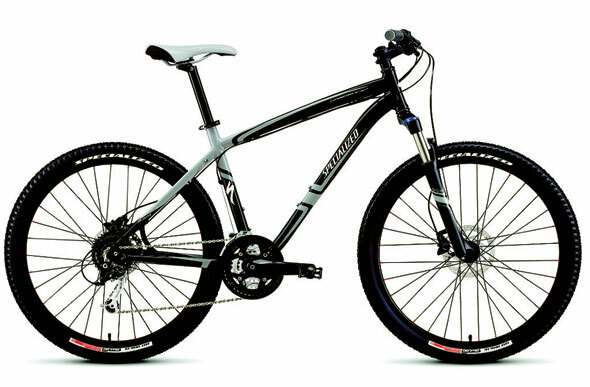 For a £40 premium over the Nucleus you can have this tasty all-terrain bike. The frame is made of the same aluminium as the Sirrus, but here it’s fitted out with Shimano hydraulic disc brakes, a Shimano Alivio drivetrain, and some chunky Specialized Fast Trak LK Sport tyres. Like the Nucleus, a Suntour fork — although with only 80mm of travel in this case — handles damping duties.